Click to watch: as featured on HINow. HONOLULU (HawaiiNewsNow) -The nineteenth Hawaii Culinary Education Foundation Charity Golf Tournament will be held on Tuesday, April 11 at the Kapolei Golf Course. 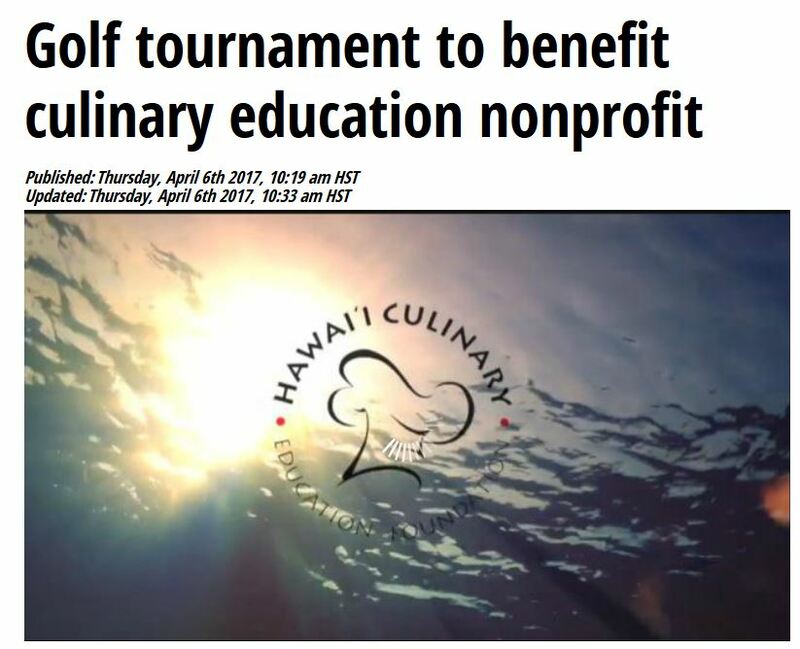 Tournament proceeds benefit the culinary nonprofit dedicated to culinary education in Hawaii. The tournament begins with buffet lunch, a noon shotgun start and concludes with an awards banquet prepared by local chefs and restaurants. The tournament raffle features thousands of dollars in prizes including neighbor island trips, state of the art electronics and luxury gift certificates. Golfers have numerous chances to win prizes in the $20,000 hole-in-one, closest to the pin, putting, chipping and driving competitions. The tournament is the Foundation’s key fundraiser, allowing the organization to sponsor educational culinary projects throughout the Islands. Programming includes Center of the Plate workshops led by award-winning Hawaii chefs and visiting Master Chef events. 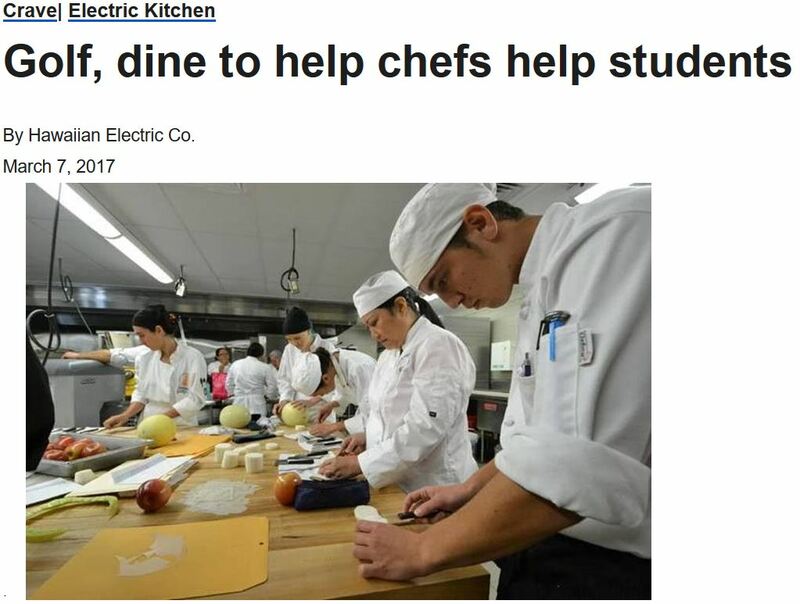 The Foundation supported programs bring local, mainland and international chefs into the classroom to present intensive learning experiences for culinary/chef instructors and local culinary students. The Hawaii Culinary Education Foundation, founded in 1998, recognizes the significant contribution of the culinary industry to Hawaii’s economy and is dedicated to championing Hawaii’s unique culinary traditions. An advisory committee comprised of prominent members of the restaurant and hospitality industry plus key leaders in the culinary field coordinates educational experiences for chef/instructors and culinary students. The HCEF Board encourages the community to sign up and support this culinary fundraiser. Cost for a team of three players is $1,400. To register, visit www.hawaiiculinaryfoundation.org or call (808) 941-9088. The Hawaii Culinary Education Foundation hosts its 19th annual golf tournament April 11 at the Kapolei Golf Course. All proceeds benefit culinary education in Hawaii. The Hawaii Culinary Education Foundation hosts its 19th annual golf tournament April 11 at the Kapolei Golf Course. 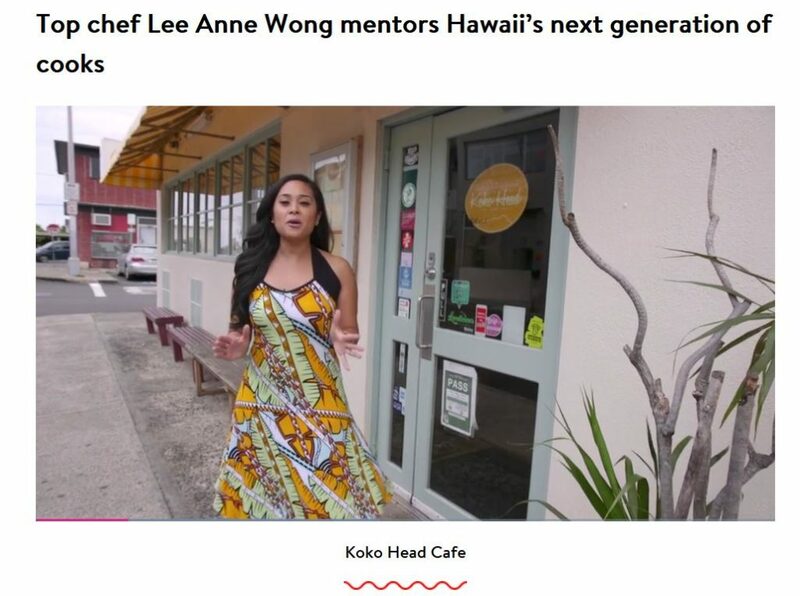 The foundation sponsors programs for Hawaii’s high school and college culinary students, bringing local, mainland and international chefs into the classroom to share cutting-edge knowledge and techniques. The golf tournament, the group’s key fundraiser, kicks off with a buffet lunch, then offers participants the chance to win prizes and enter raffles. Cost for a team of three is $1,400. All proceeds benefit culinary education in Hawaii. Visit hawaiiculinaryfoundation.org. This week, enjoy recipes from the foundation’s guest instructors. Cut zucchini lengthwise into 1/4-inch slices, discarding core. Cut slices lengthwise into 1/4-inch strips. Fill a mixing bowl with 2 cups ice and 1/2 cup salted water. Place another bowl on top of ice. In a saucepan, bring remaining 3/4 cup salted water to boil. Add garlic and zucchini; cook 2 minutes. Remove to bowl on top of ice, stirring to accelerate cooling. Reserve cooking water. Season fish with salt. In a nonstick frying pan, add 2 tablespoons olive oil and place fish in pan, skin side down. Turn on heat and cook fish, turning once. Remove from pan. Add lemon juice and reserved cooking liquid to pan; bring to boil. Add remaining 2 tablespoons olive oil and zucchini; cook 1 minute. Taste and adjust seasonings. Place zucchini on 2 serving plates along with cooking juices. Top with mahimahi. Serve with steamed white or basmati rice. Serves 2. Combine brine ingredients in large bowl; mix well. Immerse chicken in brine and soak, covered, in refrigerator for 24 hours. Heat oven to 300 degrees. Remove chicken from brine and pat dry with paper towels. Place thyme and parsley sprigs with butter in cavity. Place mirepoix in shallow roasting pan. Place chicken on top, breast side up. Brush skin with olive oil and season with salt and pepper. Roast 2 hours, basting every half hour. Remove from oven and let rest about 10 minutes before serving. Serves 6.